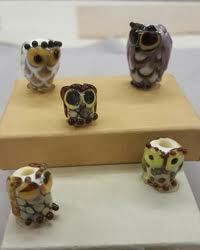 Glass Owl Bead–What a Hoot! This class is for the advanced beginner/intermediate lampworker. Expand your skills by learning embellishment techniques to add wing patterns, ears, eyes, and beak to a core barrel bead to make your personalized owl. Instructor: Wendy Ford.